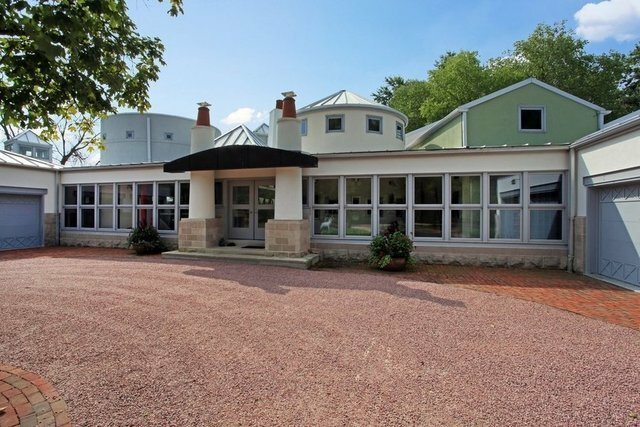 Be enthralled by this home designed by renowned architect Stanley Tigerman. The home features an open floor plan and spacious rooms, many opening to the pool and gardens. It has hardwood and limestone floors, soaring ceilings and windows that provide endless natural light. The kitchen has custom cabinets, center island, 2 refrigerators, a huge eating area and a butler's pantry. The oversized dining room is a focal point, which then opens to the stunning family room that provides for an exceptional living and entertaining experience. The master suite has voluminous closets and built-ins, a spa bath, and a sitting room. Additional features include the circular, wood-paneled library, 2 bedrooms with en-suite baths and a den/4th bedroom. This post-modern home is set back in the midst of private landscaped and wooded grounds, including flowering gardens, an in-ground pool and pool house. There are two 2-car garages and ample parking for guests.